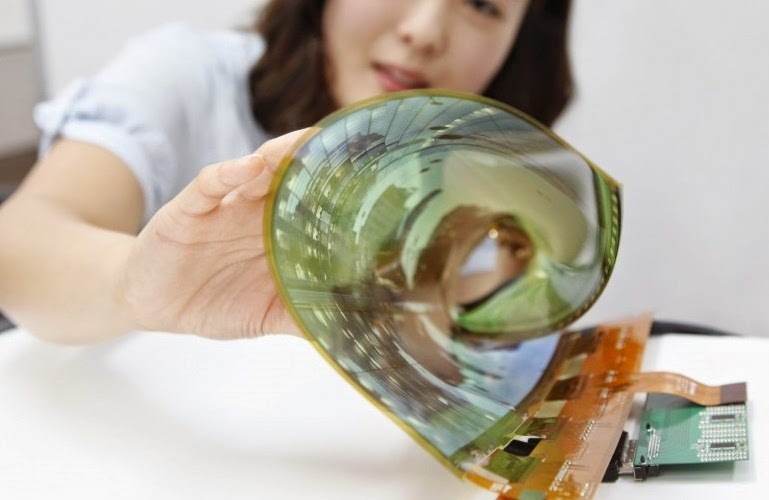 After unveiling the world's first flexible OLED TV at CES earlier this year, LG has gone a step further with the unveiling of two new 18-inch OLED panels: the first is a transparent display, while the second can be rolled up. Although both fall short of the 77-inch flexible TV on show at CES, the company says the new panels prove that it has the technology to bring rollable TVs with screens in excess of 50 inches to market in the future. 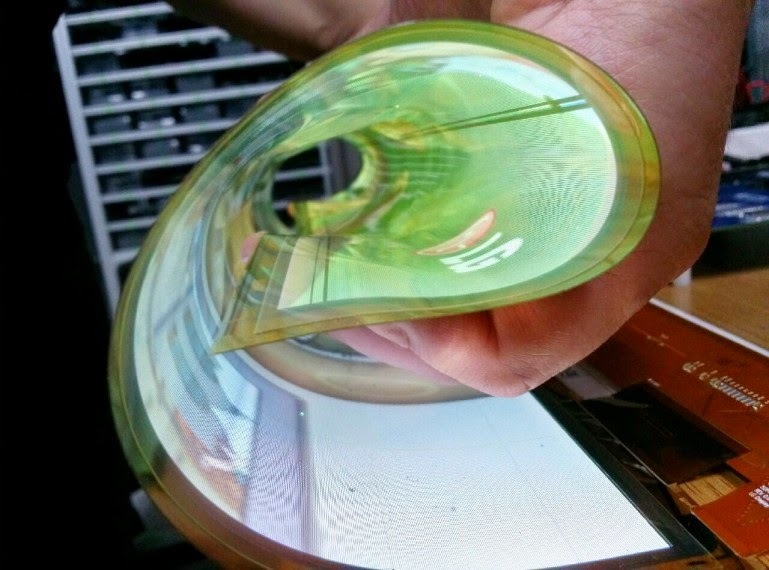 Unlike the aforementioned 77-inch flexible TV that has a fairly limited range of changeable curvature, LG Display's latest flexible OLED panel boasts a curvature radius of 30R. This means the 18-inch panel can be rolled up into a cylinder with a radius of 3 cm (1.18 in) without the function of the 1,200 x 810 pixel display being affected. The company says this impressive flexibility was achieved by using a "high molecular substance-based polyimide film" as the backplane rather than conventional plastic. This polyimide film also allowed the thickness of the panel to be reduced, further improving the panel's flexibility. The transparent OLED panel, on the other hand, was created using LG Display's transparent pixel design technology. With transmittance of 30 percent, the company says the panel is superior to existing transparent LCD panels that generally achieve around 10 percent transmittance (although rival Samsung unveiled a transparent color LCD panel in 2011 boasting transmittance of over 15 percent). 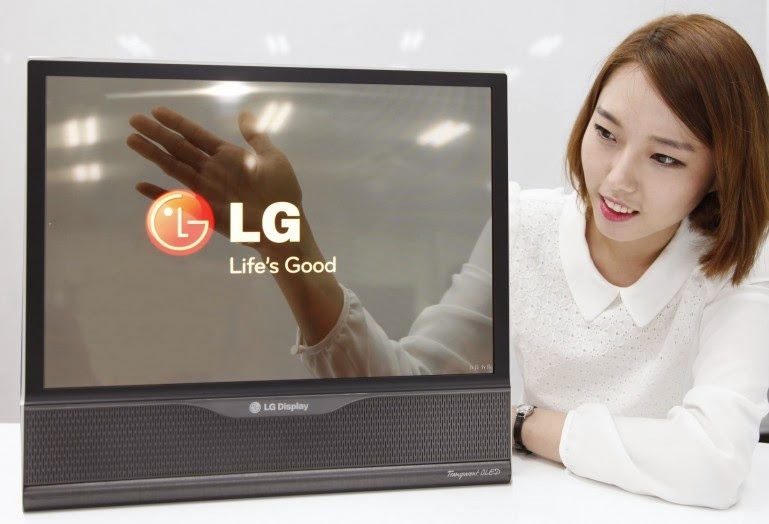 LG Display claims to have also reduced the haze of the panel, caused by circuit devices and film components, to just 2 percent. "LG Display pioneered the OLED TV market and is now leading the next-generation applied OLED technology," says In-Byung Kang, Senior Vice President and Head of the R&D Center at LG Display. "We are confident that by 2017, we will successfully develop an Ultra HD flexible and transparent OLED panel of more than 60 inches, which will have transmittance of more than 40 percent and a curvature radius of 100R, thereby leading the future display market."